By default, WordPress comes with a basic built-in menu system that can help you create a simple navigation menu. However, it is quite outdated and does not hold the power that some website owners wish it would. More importantly, it is not readily responsive, causing users on the go a lot of frustration. Luckily, there are some amazing WordPress menu plugins on the market today that can enhance your website’s navigation. By integrating seamlessly into your website and offering an exceptional mobile viewing experience, these menu plugins are sure to wow your site visitors and impress them with their advanced functionality. Come see which WordPress menu plugins are best suited for your website’s navigational needs! UberMenu is a user-friendly and highly customizable Mega Menu WordPress plugin. For instance, it is easy to use with the WordPress 3-Menu Management System and allows for creative personalization that packs a punch. It is designed to work as a full-grid system that allows for columns, rows, tabs, images, maps, and even icons. Each menu item comes with its own individual layout controls, and of course, it comes fully responsive with a touch interface for the ultimate in mobile optimization. Lastly, you can add images of any size to your menu items to improve the navigation and visual appeal of your WordPress website. Mega Main Menu is a multifunctional, fully responsive, WordPress menu plugin with plenty of options for creating custom drop-down menus. However, it also maintains a simple interface that even new website owners can handle. Start by placing any type of content in your drop-down menus – links, text, widgets, and shortcodes – using one of 10+ dropdown combinations. Next, change your color schemes, add background images, and choose from over 600 custom Google Fonts and 1600+ vector icons that are guaranteed to look good on all mobile devices. In the end, Mega Main Menu has all the features you need to create a completely customized menu, without all the hassle of configuring complex settings. Liquida Mega Menu (LMM) is a flexible menu plugin for novice website owners or advanced developers. Based on the solid Bootstrap 3.3 foundation, this menu plugin has an intuitive interface integrating directly into the WordPress dashboard. From there, you can create unlimited menus with zero coding skills, customize using the unlimited available skin options, and even add cool animation effects to all of your dropdown menu items. Responding to all screen sizes, LMM is the perfect option for improving the user experience amongst all of your site visitors no matter what device they access you from. Max Mega Menu works by automatically converting your existing WordPress menus into mega menus. Simply take control of your existing menus and make them more intuitive, accessible, and touch ready for site visitors. For example, add standard WordPress widgets to any menu item, use the Live WordPress Customizer to make real-time changes to the style and behavior of your menus, and rest assured you can manage multiple menus from one convenient location. More so, creating menus is easy to do with the drag-and-drop menu builder so you can make sure every menu element you want to include is perfectly placed for site visitors to view. Hero Menu only requires a few easy steps to create a customized, slick, and professional looking WordPress menu. From highly complex mega menus to simple dropdowns, this plugin can do it all. For example, add WooCommerce items to the mega and main menus using the drag-and-drop menu builder. In addition, use the drag-and-drop structure builder to add menu items easily to the main and submenus. With 60 color presets available, branding is not a problem, and since this menu plugin comes fully responsive, all site visitors can navigate your site with ease. Noo Menu is a revolutionary menu plugin due to its interactive and intuitive admin interface, allowing you to change almost every single thing to match your web design – all from one place. Easily switch to the Noo menu builder from your WordPress dashboard and start making changes. Add text, images, video, widgets, and forms to any submenu. In addition, utilize the built-in mega menu toolbox for managing the structure of all submenus in real-time. Lastly, change things like menu height, box and text shadows, corner radius, blur distance, background gradient, and more using this all-inclusive, feature-packed menu plugin. Mega Menu is a powerful menu plugin brought to you by WooRockets. Focusing on user experience with its responsive design, and ease of use behind the scenes with its dedicated drag-and-drop menu builder, Mega Menu gives website owners complete control over the look of their menus and site visitors complete control over their navigation of your site. Finally, create and save menus for later use, take advantage of the live preview feature while making changes, and add text, links, icons, widgets, or images to any menu item. Responsive Menu is a highly customizable menu plugin for WordPress that takes menus you create in the admin panel and turns them into hamburger menus for your site. There is no need for coding knowledge with this menu plugin since all customizations are performed in the settings section. Create a hamburger menu button or add a custom image that either slides, pushes, or fades out. More so, enable sticky navigation or a scrolling effect, and add a custom logo to your menu for brand recognition. Side Menu adds sleek and amazing side menus to your WordPress website so visitors can easily navigate your site. With this plugin, add unlimited menu items, customize different menus for different pages, and choose whether to display them on the right or left of your site. In addition, insert internal or external links into menu items, set up anchor links for in-page navigation, and even integrate social share buttons, a print button, or a back-to-top button. Lastly, pair this menu plugin with the Ultimate Modal Windows plugin and watch menu items open up in modal windows for the ultimate user experience. In the end, how your site visitors interact with your website’s content should be a priority when it comes to web design. Without people engaging in your site’s content, there will be no loyal followers, no interested customers, and no sales. A great looking website with all the bells and whistles does you no good if your visitors disappear before finding out what you have to offer because they cannot figure out how to navigate your website. If you want to ensure your readers can access all of your website’s content and receive an optimal viewing experience, consider using one of the above-mentioned WordPress menu plugins. Though the default WordPress menu system is adequate for those looking to keep their navigation super basic, utilizing the power of a WordPress menu plugin will propel your site’s usability far beyond that of WordPress’ built-in menu functionality. 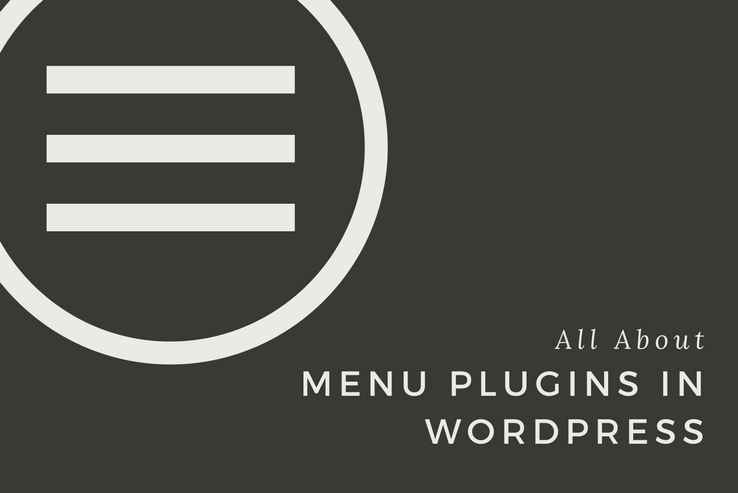 Have you ever used any of these WordPress menu plugins for your website? Which one did you use? I would love to hear all about it in the comments below!